ISLAMIC FUNDAMENTALISTS WIN 70% OF SECOND ROUND PARLIAMENTARY VOTING…….. – The Tundra Tabloids……. ISLAMIC FUNDAMENTALISTS WIN 70% OF SECOND ROUND PARLIAMENTARY VOTING……..
(al-Reuters) – Egypt’s two leading Islamist parties said on Sunday their separate party lists secured about three-quarters of votes cast in the second round of a parliamentary election, extending their lead in the three-stage vote. A source from the Muslim Brotherhood’s Freedom and Justice Party said it was on track to win about 40 percent of votes for party lists, based on results from most districts. 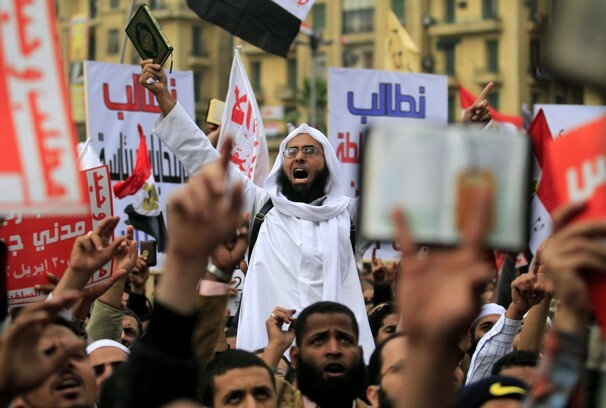 A spokesman for the ultra-conservative Salafi al-Nour Party said its list received about 35 percent of votes. In the first round of the six-week poll, the FJP won about 37 percent of votes for lists and Nour secured about 24 percent. The poll is the first since President Hosni Mubarak was ousted in February. The West long looked to strongmen in the region like Mubarak to keep a lid on Islamists, and has watched warily as they have come top in votes in Tunisia, Morocco and now Egypt. An official breakdown of results for the list vote has yet to be announced. But party representatives watch the count and their predictions after the first round were broadly accurate. Despite their commanding position built up so far in the vote that runs till January, it is unclear whether the two rival Islamist groups will form an alliance in parliament, as they have each spoken warily of the other.